Discover the style and comfort of a high quality bed and a sleek vintage looking free standing penny slipper tub at Dot & Bo. When redecorating your bedroom and bathroom, these are the two most important pieces of furniture. The beds come in many styles. My favorite is the Clifton Bed. Enjoy the beautiful dark brown walnut-finished wood veneer and rubberwood for the headboard to the footboard. Along with a motif type puzzle pattern which gives off a comfortable and warm feeling when looking at this textured design. The tub is designed in a stand out shinny copper. 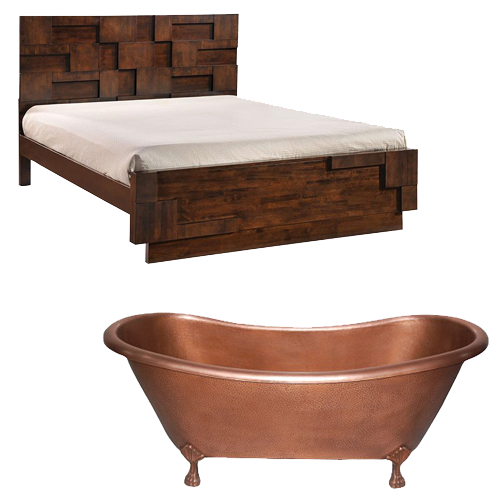 Below are some special bed and bath furniture that is on sale at Dot & Bo. Click on the images to view these on their website. Not that saying a bed and a bath will lead to Fifty Shades of Grey, but have you seen this very popular sensual movie that first came from the book? You can buy the movie and books here.